1. A person walks from point A to point B, 600 meters north; then to point C, 400 meters west; then to point D, 200 meters south; and then finish at point E, 700 meters east. What is the magnitude of the displacement? 2. A person walks 10 meters west, then 12 meters south, and then 15 meters east. What is the displacement from the original point? 3. A person walks 1 meter west, then 3 meters south, and then 5 meters east. 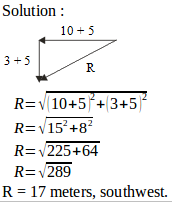 What is the displacement from the original point? 4. What is the displacement of the object according to the figure below. 5. A person walks 80 meters north, then 80 meters east and then 20 meters south. What is the displacement of the person? 6. A person walks 6 meters east, then 6 meters south and then 2 meters east. What is the displacement of the person? 7. An object moves 40 meters east, then moves in a direction 37o north of east for 100 meters, then 100 meters north. What is the displacement of the object? sin 37o = 0.6. 8. An object moves 4√3 meters west, then 4 meters north, and then moves in a direction 60o east from the north for 8 meters. What is the resultant of the displacement?